Gah! I hate it when bad timing on my part and bad weather delay a review, but that's my story and I'm sticking to it. The nice folks at Uuni sent me their pellet-fired pizza oven, and although I've wanted to test it (I love pizza), it simply hasn't happened. It's an outdoor pizza oven. Every time I had ingredients on hand, it snowed. If I ran out of cheese (which happens with frightening regularity) the weather was nice, but I had no time to do a grocery run. 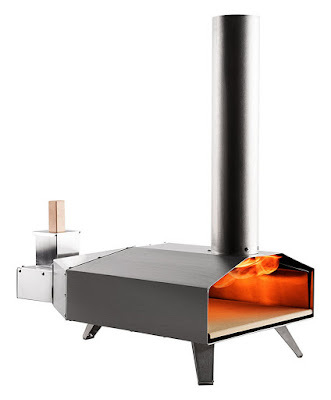 I've been insanely busy with other things, so ... the Uuni pizza oven has yet to be reviewed. I mean, seriously, I went grocery shopping yesterday and bought everything I wanted for pizza. It was nearly 70 degrees. I was looking forward to a pizza for lunch today, but when I woke up there was snow outside. Snow. Cold. Blergh. I know things about it that I can tell you. This thing is fired by wood pellets. So it's a wood-fired pizza oven, but I don't have to chop down trees to use it. It's light enough for me to move it easily, so I don't have to ask for help from the neighbors when I want to move it into an appropriate spot for cooking. It heats in 10 minutes, so I don't have to wait an insane amount of time when I decide I want pizza. And it cooks pizza really fast (they say about a minute) so I don't have to pace around waiting for a pizza to cook. On the other hand, I shouldn't leave a pizza in there while I go to the mailbox unless I run to the mailbox. And if I ever decide I want to make two or three or four pizzas in a row, the first one will still be screaming hot when the last one comes out of the oven. What I don't know - which will come with the review - is how long it takes to cool down and whether I like the way the pizzas turn out. So ... as soon as the weather and my schedule allow, there will be a review. And if this puppy works the way I think it will, there may be some recipes as well. Because, heck, it looks like a whole lot of fun. I received this from the manufacturer at no cost to me for the purpose of a review. Which I promise will happen. Hi Donna! We can highly recommend cooking in the snow with Uuni ;) When it comes to cooling down, if you remove the hot pellet tray and place it safely on the ground (in the snow is even better! ), the whole unit will cool down very quickly. We look forward to seeing your first cook!